Imogen's Typewriter. 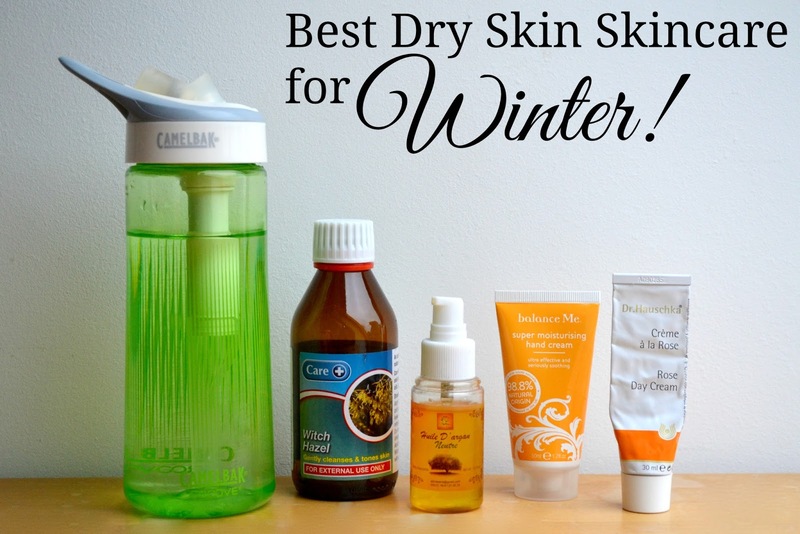 : Best Dry Skin Skincare for Winter! Best Dry Skin Skincare for Winter! Winter has rolled around again and while it isn't as horrendously cold as I was expecting, the wind is whipping around and the rain is being blown into your face the minute you step outside. It's getting pretty rough on my dry skin. I did a best harsh Winter skincare post last year and thought I'd update it with a few things I've discovered this year! Water. Water. Water. Oh- and some more water. Yeah, I know you've heard it before and I know in Winter we all really want a cup of hot chocolate instead but water really is a dry skins best friend. Your skin is the first place that inner health problems show, if your skin is dry- you're probably not getting enough hydration. Carry a bottle around everywhere you go. I have cats so glasses and cups are a no-go unless you want a little wet nose stuck in your drink but I rate bottles anyway. Portable and reusable bottles are much better for the environment, this is a great list if you have no idea where to go but personally I didn't really rate the Bobble bottle. However, I love my Camelbak Groove that I bought from Amazon for £18.70. And because it's winter, you don't need ice because water from the tap is cold as heck! I bought this Witch Hazel toner from my local supermarket after having a pretty painful allergic reaction to a face mask and wanted to only use natural basic products on my face until it calmed down. I've been using it since then and keep coming back to it even though I have a fair amount of other, more expensive and with impressive claims, toners in my collection. I love it for Winter especially because the wind and rain really make my skin hurt and this soothes it. I did a whole post on oil cleansing earlier this month that you can read that here but the basics is that instead of cleanser, you rub oil into your skin then wash it off. It's affordable, there are certain oils that are amazing for dry skin- I personally switched to Argon oil and Sweet Almond oil in the Winter- and it's natural. There's nothing shady in a pure oil! My pick is the Dr. Hauschka Rose Day Cream. Don't let the name fool you, a day cream this is not. This is thicker and stronger than any other moisturiser I've ever used and packs a mighty punch. It even beats last years pick of the Origins Drink Up Intensive mask because it is just so moisturising. Definitely not for the faint hearted or the casually dry. I got mine last Christmas and it's lasted all year, you can get a tube here if it sounds like something you need! Carry around a multi-use hand cream. I get dry hands in winter, but I also find that my arms get dry really easily so rather than a super expensive hand cream that I use sparingly, I like to have something a little more reasonably priced that I can slather all up my arms without guilt. I've been trying out the Balance Me Super Moisturising Hand Cream* and it's exactly what I need. You can get it in a 100ml tube here but it also comes in a set with the Rose Otto hand cream. I have an obsession with rose so this is on my to-buy list! What works for your skin? *Post contains affiliate links. I was sent the Balance Me hand cream to try, this has not changed my opinion and I am not obligated to talk about it. Fiction Friday: The Nutcracker Ballet! Beauty Review: Formula X - Drawn To You! Fiction Friday: Winter Wonderland Book Tag! Gifts: For Nerdy Beauty Lovers! Why I Love Oil Cleansing! Fiction Friday: Books I'm Reading this Christmas. Beauty Review: KIKO Nail Lacquer in Grass Green! Loving Lately: The Countdown to Christmas!